Here's my card for this week's Viva la Verve sketch. It's doing double-duty as my entry for this month's Verve Diva Dare to create a baby or kid themed card. The alphabet patterned paper I found in my paper stash was the perfect starting point for my baby card. I adhered a strip of the patterned paper to a pale blue card base. The panel was topped with a celery fishtail flag strip, then with a pair of pale yellow fishtail flag strips. 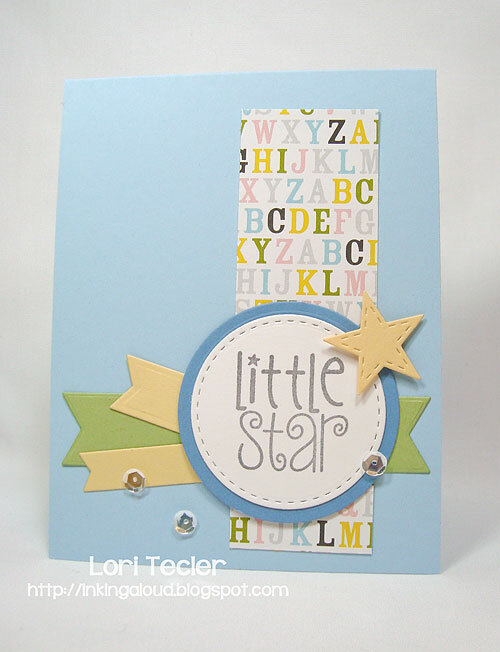 I stamped the set's "little star" sentiment in gray ink on a white stitched circle die cut. After matting the sentiment on a blue circle, I added it to the cardfront over the fishtail flag strips. To go with the sentiment, I die cut a small star from yellow cardstock and used foam tape to adhere it to the top of the sentiment panel. A trio of clear sequins add a little sparkle--the perfect finish for a star themed design! This is absolutely adorable, Lori! Love that alphabet background paper and the stitched star! Adore this. The alpha paper is fabulous as is the stitched star. Way to rock the sketch too! Thanks for joining us for this month's Diva Dare!